Holt Farm is a 47 acre farm situated in the parish of Michaelchurch Escley, west Herefordshire. 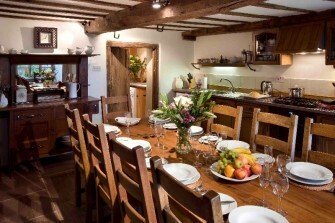 The farmhouse has great history and is believed to date from the early 17th century. Holt Farm history begins in the 1800’s. The farm was previously called New House Farm and was renamed in the in the early 1990’s during renovations, to regain its former identity and distinguish it from other properties with the same name in the area. There was a date stone of 1805 on the house which is thought to signify a renovation and the house became known as New House Farm from that period. The earliest documents held in the family date from 1782. In 1836 a young Sarah Holt inherited the farm. In 1874 she granted Isaac Phillips a 10 year lease. The lease continued for a longer period and in 1892 when Sarah Hemming [formerly Holt] died she bequeathed New House Farm to her tenants Isaac and Mary Ann Phillips. Ten years later the census shows the couple had Isaac’s niece staying. She was Elizabeth Maddy aged 24 and her young son Thomas Maddy was aged 4 months. Thomas was born at Holt Farm and was Gordon’s grandfather. Isaac and Mary Ann Phillips later adopted the lad and he took the name Thomas Phillips Maddy. His only offspring is daughter Gladys now aged 99 who was also born at Holt Farm and has enjoyed seeing the full renovation of the farm house and the farm barns into holiday accommodation. The renovation of the original Farm House took place over time during 2003-2004, and as many original features as possible were retained. The addition of underfloor heating under the flag stones has made a huge difference in winters! 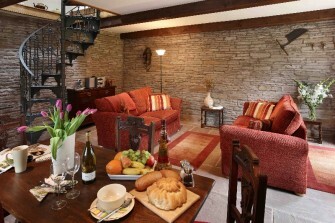 The adjoining Stable was converted into a one bedroom holiday cottage at the same time. The original cobbled floor in the stable was uplifted stone by stone and now forms the path between the courtyard and the Barn lower bedroom. Work then commenced on the Wain House. It was the shed where the horse carts were kept and is now a two bedroomed all level access holiday home. Holt Barn was the last conversion but not the least! The huge sliding steel doors have been replaced by full height glazed doors and windows flooding the interior with light. 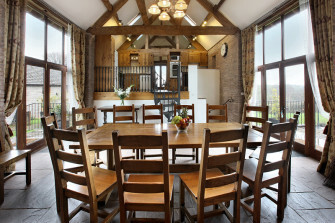 The original hay loft is now the kitchen and bedroom, the lower level where the cows were housed in the winter and milked is now a bedroom, shower room and utility room. In what is now the dining and living area the small quantity of farm equipment was stored. The land is farmed in association with two other family farms in the parish. Hereford cattle are reared on clover based pastures. Wheat and oats are grown for cattle food, local sheep are grazed during the spring and autumn. Holt Farm has a rich farm history. Now converted into holiday accommodation, Gordon and Ruth are more than happy to show our guests around and tell them more about the history of the farm. 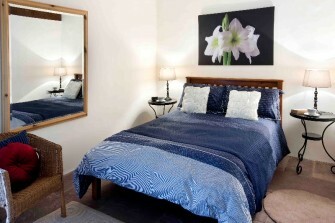 Find out more about the holiday cottages at Holt Farm here, or call us on 01981 510238.